"These are so delicious they just melt in your mouth! They have a bakery back home that has these amazing lemon scones that I was addicted to. Through much trial and error I think I've got them!" Mix flour, white sugar, baking powder, baking soda, and salt in a bowl. Cut in cold butter with a pastry blender until mixture resembles coarse crumbs. Whisk milk, 3 tablespoons lemon juice, lemon zest, and vinegar in a small bowl and stir into flour mixture until moistened; turn out onto a lightly floured surface. Knead dough briefly for 5 or 6 turns. Pat or roll dough out into a 1 inch-thick round. Cut into 10 wedges and arrange on a baking sheet leaving 1 inch between each wedge. Bake in preheated oven until bottom edges are lightly tan, 11 to 14 minutes. Allow scones to cool for 15 minutes. While scones are cooling, stir confectioners' sugar, melted butter, 2 1/2 tablespoon lemon juice, and vanilla extract in a bowl until smooth. Stir water into sugar mixture, 1 tablespoon at a time, until mixture is easily drizzled. 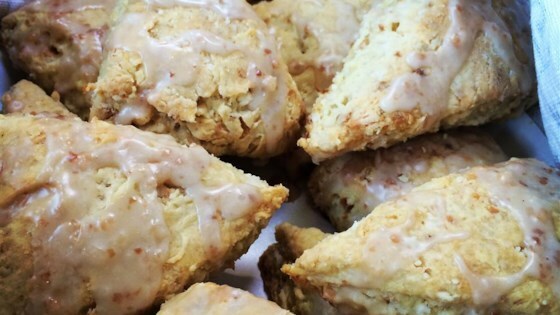 Drizzle glaze over warm scones. I made these as directed last night. They came out perfect! Had a hard time finding just lemon scones, then I found this gem. Thank you for a wonderful recipe! These were very good. They turned out very soft, almost cake-like. It isn't precisely what I was expecting but they are tasty!